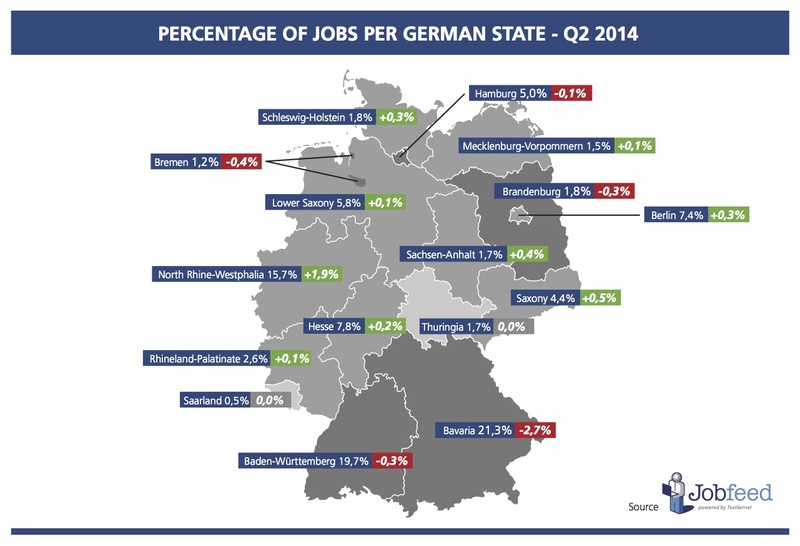 Today Jobfeed published the Q2 – 2014 index on the German online job market. This index is based on the analysis of more than 2.5 million jobs postings (more than 1 million unique jobs after deduplication) published in the second quarter of 2014 in Germany and collected by Jobfeed. Jobfeed is the labour market analytics tool of Textkernel that collects and categorises all online jobs in Germany and makes them searchable. The distribution of jobs across profession classes for Q2 2014 shows little change compared to Q2 2013. 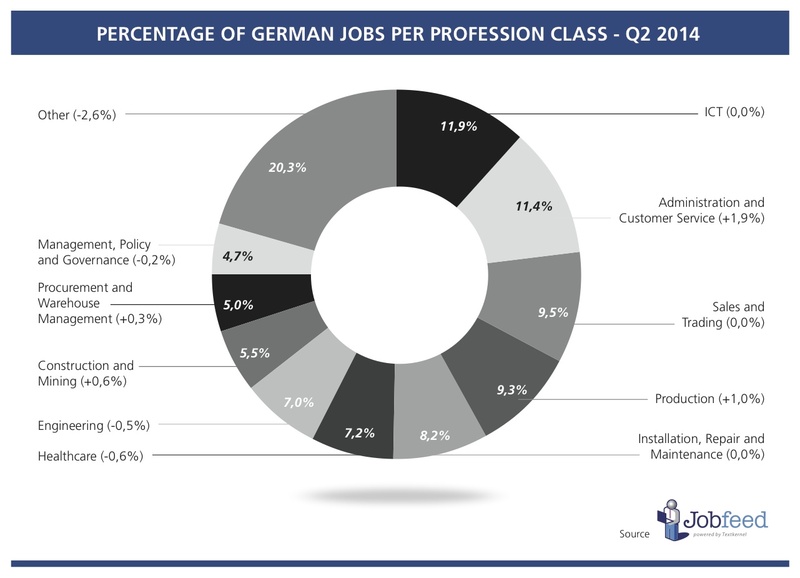 IT remains the leading profession class in Germany amounting for 11.9% of all jobs advertised, just like in 2013. Sales and Trading is stable with 9.5% of all job posting, but loses its second place to the profession class Administration and Customer Service. This class gained most market share (+1.9%) compared to last year. Production and Construction were also among the fastest growing classes, gaining respectively 1% and 0.6%. The proportion of Education and Training (-1.4%) and Healthcare jobs (-0.6%) went down compared to Q2 2014. Despite recording a large decrease (-2.71%) compared to 2013, Bayern remains the largest employment area in Germany representing 21.3% of all jobs advertised online. Baden-Württemberg keeps its second place with an unchanged share of 20%. Third employment hotspot Nordrhein-Westfalen is up by 1.9%, the highest growth rate witnessed among all German bundeslander. Lower Saxony recorded the second highest growth rate of 0.9% compared to the same quarter last year. The state city of Hamburg showed a rather important decline down from 6% to 5% in the span of a year. Though the sector’s share shrunk from 31.3% in 2013 to 29.8% in 2014, Manufacturing remains by far the largest employer in Germany. The Trade/Retail and IT sector still occupy the second and third place with slightly higher proportions of respectively 14.4% and 9.6%. Hospitality, which held fourth place in 2013, dropped to being the ninth biggest sector with a decrease of -1.44%. Media and Communication, Healthcare as well as the sector of Culture and Recreation have all seen a slight increase in market share comprised between 0.7 and 0.6 percent compared to 2013. 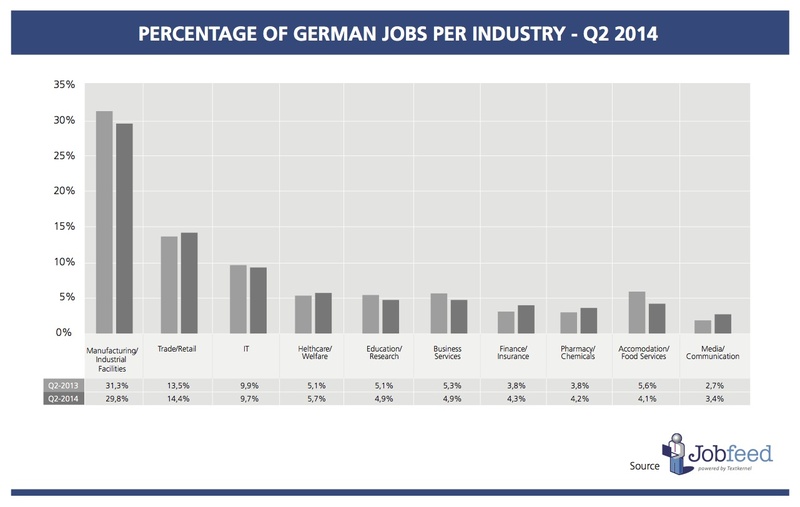 Download the full Q2 – 2014 index on the German online job market. This index is also available for the Dutch and French market. Numbers come from Jobfeed, the labour market analysis tool of Textkernel, that collects and categorises all online jobs and makes them searchable. Each quarter, Jobfeed will provide the latest statistics on the online job market. For this analysis 2.5 million German job ads, posted between 1 april and 30 June 2014 have been analysed, categorised and deduplicated. Over 1 million unique jobs, excluding internships, remained and are the source on which these analyses have been performed. In 2003, Textkernel started aggregating job vacancy information for matching and analytical purposes under the label ‘Jobfeed’ in the Netherlands. Now, Textkernel is the market leader in this domain and in 2012 expanded Jobfeed to Germany and France. Jobfeed searches the Internet daily for new jobs via an automated process and determines with machine learning technology whether a page is a job vacancy or not. Found jobs are automatically cleaned, extracted, categorised, enriched, deduplicated and recorded in the Jobfeed database. Due to its strong technological base and domain knowledge, Textkernel created a unique source for making job market data available for insight into the demand side of the labour market.